Steady changes to this travel corridor can be traced to shortly after 1900, when an Indian path through the mountains of the Cascade Range was turned into a road. This road eventually became the primary route between the Puget Sound lowlands and all parts east. Development along the highway led to cabins, retail stores, a ski area and extensive secondary roads and logging. Around Puget Sound, a major metropolis and bustling economy took shape. Currently an average of nearly 30,000 vehicles per day travel this section of I-90, despite periodic closures due to avalanches and icy road vehicle pile-ups. Wildlife studies using radio telemetry and genetics have demonstrated that some wildlife avoid crossing this busiest of the Cascades’ roads. Reversing a trend, like the barrier effect of I-90, is not easy. Considering the kind of growth in the Puget Sound region and the demands for transport of commodities through Snoqualmie Pass, many would consider the reversal of the barrier effect an impossible task. But, an unusual coalition developed around a project that would accomplish the re-building of I-90 east of Snoqualmie Pass. Conservation groups like the Sierra Club and Conservation Northwest were ever-present. 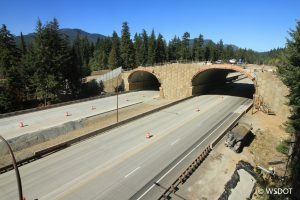 The U.S. Forest Service, which required consistency with their Northwest Forest Plan, pressed for a highway design that provided for continuity of environmental functions and safe passage of all wildlife species. The Washington Department of Fish and Wildlife and the U.S. Fish and Wildlife Service saw the opportunity to make a real difference for wildlife, and signed on to be part of Interdisciplinary and Mitigation Development Teams that would chart the course for the project. 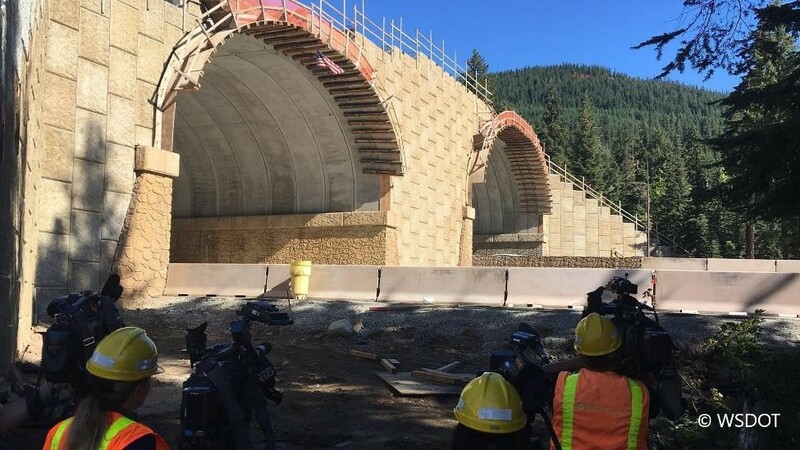 Through all of this, the Washington State Department of Transportation maintained a sincere interest in finding common ground with conservation interests and establishing a plan for the highway that would succeed in reconnecting habitats north and south of the interstate. The Mitigation Development Team met, deliberated, and wrote up alternatives for the rebuilt interstate’s design. Its aim was the restoration of ecological connectivity. The group benefited from advancements in road ecology practices that were occurring in Europe and in Banff, Alberta. Every other year members of the group attended the International Conference on Ecology and Transportation, a meeting that featured road ecology research and cutting edge transportation projects from all over the world. The collaborations of the inter-disciplinary team and mitigation development team weren’t always easy, and it took perseverance to keep everyone talking and moving the project forward in a way that all parties could value. The big challenge, though, was legislative action to fund design and construction. Former Washington Secretary of Transportation Douglas MacDonald was a supporter, with a vision for the Department of Transportation that included greater compatibility of the highway system with surrounding environments. For this project, private business interests were willing to join conservationists in supporting the project and all of the mitigation that went with it. The broad spectrum of supporters was not lost on the State Legislature. They saw a request for funding that was nearly impossible to refuse. Today, you can see that phase 1 construction has produced a highway that bridges habitats where animals pass through at all hours. Phase 2 is under construction and all eyes are on the progress in completing the Keechelus wildlife overpass bridge. The biologists who are monitoring these new wildlife crossings with trail cameras and thermal video cameras exult in the successes that are already evident. Wildlife are moving safely under the interstate – deer, elk, coyotes, raccoons, and a whole host of smaller critters. It’s only a matter of time before some of the more rare species, like wolverine and fisher, are detected using the structures. Kelly McAllister works for the Washington State Department of Transportation.